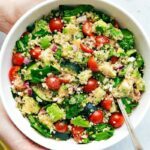 This avocado quinoa salad recipe is a powerhouse salad packed with good-for-you ingredients and the best healthy lemon vinaigrette. Quinoa is one of my favorite “superfoods” and in salad form, it combines with other vegetables to make a well-rounded and healthy meal. This quinoa salad is fresh, light, a little tangy, filling, and so flavorful. 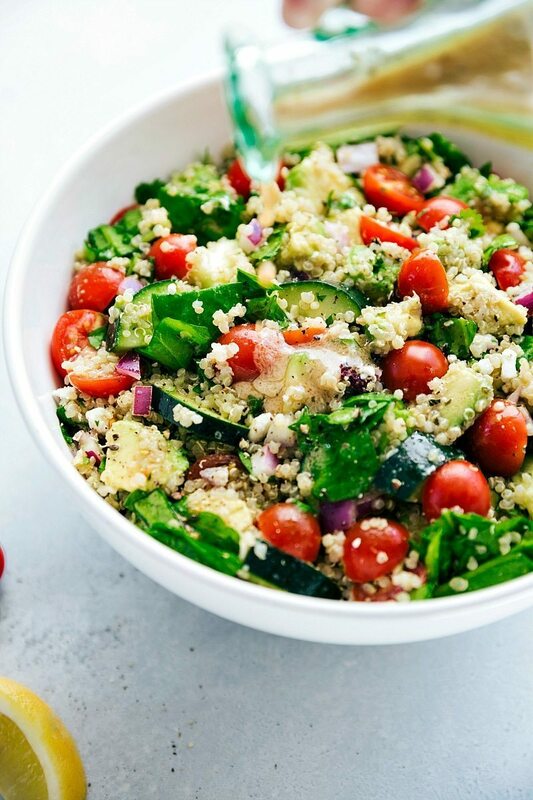 The veggies work so well with the quinoa and the dressing goes perfectly with everything else. I’ve mentioned the toddler’s affinity for all things healthy food — he ADORES salads and sandwiches and won’t touch a burger or fried food with a 10-foot pole. Of course he likes his fair share of less-than-healthy foods, but if you ask him what he wants to eat it’s generally something pretty light and/or healthy (such as this quinoa salad!). The other day I was out and my husband had the two boys with him. He’d planned a fun “boys” day complete with arcade games and burgers with fries. I got a text about an hour after heading out that said, “Grey is begging me for salad with tomatoes. Is this for reals?” Yes, yes it is. Yes, my 3-year-old really asks for salads and he really eats them all the time. The more veggies in them, the better! In fact, as I was making this very salad for him, he grabbed a cucumber off the counter and started eating it straight up without it being cut at all. And the tomatoes were scarce in the salad since he’d eaten most of those too. Needless to say, this quinoa salad is a hit at my home! And not only with the toddler — everyone loves it! Parts of this quinoa salad can be made ahead of time, but it is best enjoyed shortly after being dressed and assembled. You can prep all the veggies (minus the avocado), quinoa, and dressing ahead of time and store them separately in the fridge. When you’re ready to eat, chop the avocado (you’ll want the avocado prepped as close to eating as possible) and add it to the salad along with the dressing. If you aren’t planning on finishing this salad all in one day, I’d recommend keeping the dressing separate from the salad and only dressing what you’ll be eating. 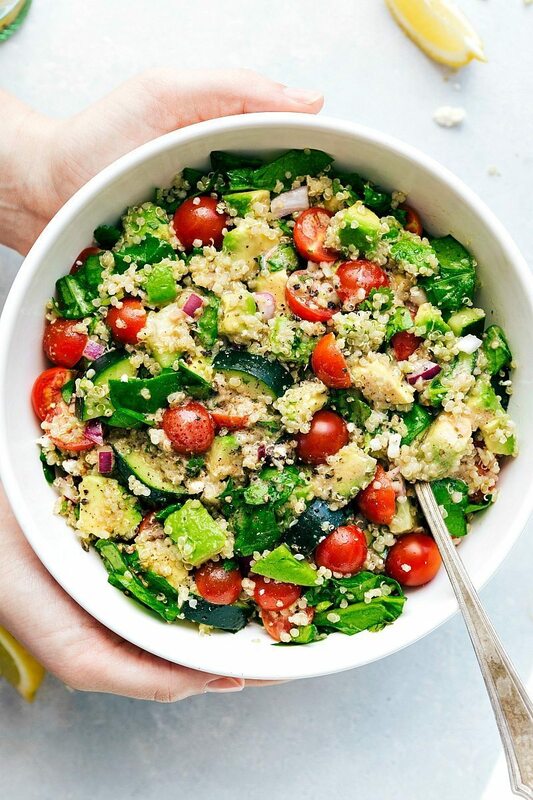 This Avocado Quinoa Salad is a powerhouse salad packed with good-for-you ingredients and the best healthy lemon vinaigrette. Cook the quinoa according to package directions. Fluff and set aside to cool. Meanwhile, prep the dressing. Whisk the red wine vinegar, Dijon mustard, oregano, garlic, 1/2 teaspoon salt (or to taste), and 1/4 teaspoon pepper (or to taste) together in a small bowl. Slowly add in the olive oil into the vinegar mixture while whisking briskly. Whisk in the lemon juice. Pour into a jar and store in the fridge while prepping the vegetables. Prep the veggies: Halve the cherry tomatoes, chop the cucumber (peel if desired, we leave the peel on), finely chop a quarter of a red onion, roughly chop fresh spinach, remove the pits and chop the avocados. 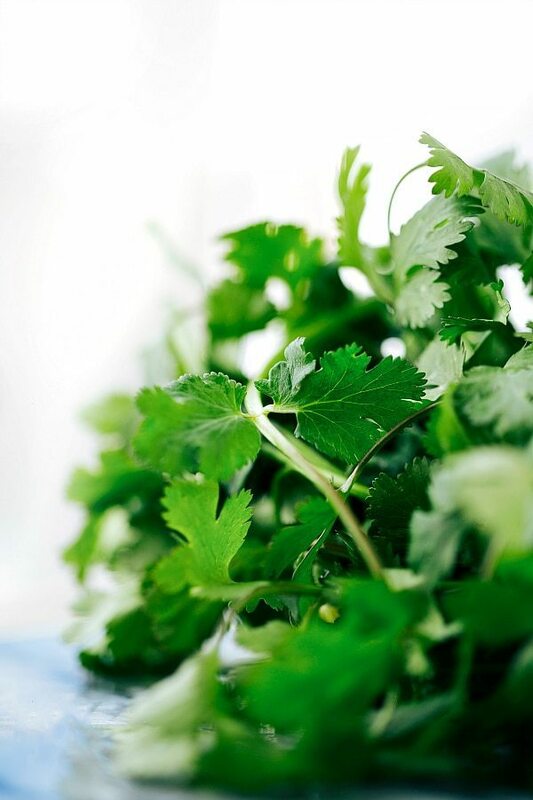 Finely chop the cilantro if desired. In a large bowl, add in all the prepped veggies and quinoa. Remove the dressing from the fridge and shake it well and then pour over the salad*. Toss the salad and then top with feta cheese if desired. 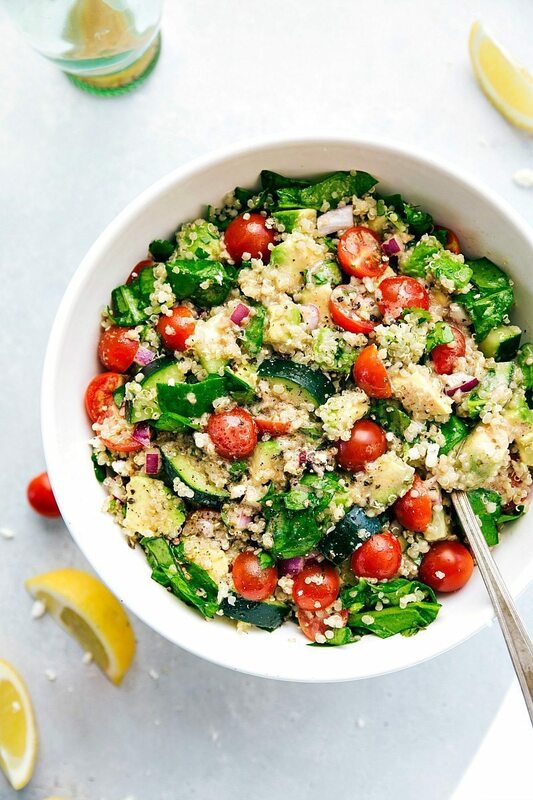 Wow, I haven’t tried yet this quinoa salad before right now it’s summer and I’m looking for a light and healthy food for my health and quinoa is the best, so definitely trying it. This is so funny! I hope my little boy Thomas will be the same! It’s my dream 😉 He’s 15 months and he loves veggies and fruits, but he doesn’t like yet salads. I guess he’s too young for that, right? Lovely, lovely salad! Eating clean is much easier when it looks like this! ? Thanks so much Anna! 🙂 Glad you enjoyed this salad! We followed the recipe to a “T” and it was dee-licious! So fresh and flavorful! 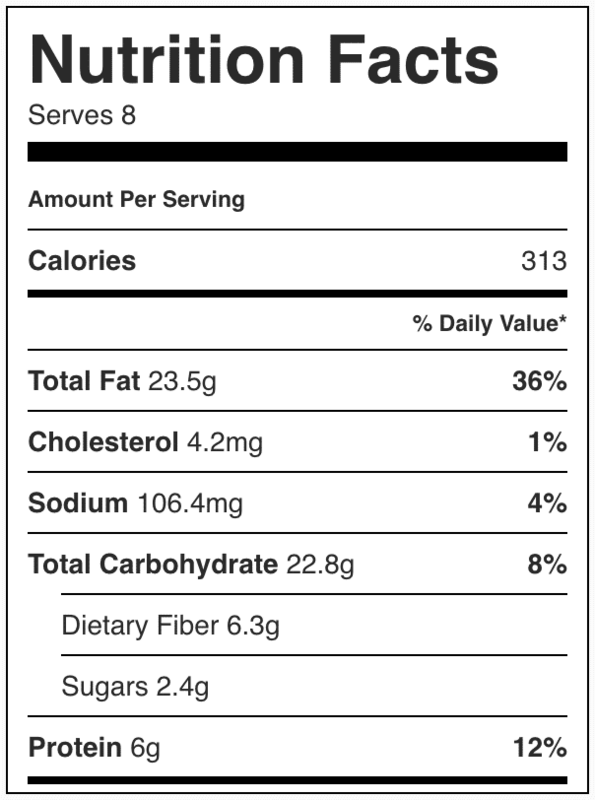 Added a little baked tilapia for a tasty, healthy meal. Thanks for the recipe–it’s a keeper!! Made this for lunch today, as I had on hand all the ingredients. It was fantastic! My husband loved it. Thank you, for this amazing recipe. I will definitely be making it again in the future, as it was easy, quick and delicious. Just made this and loved it because it’s not overly Mediterranean. No olives, left out feta. Dressing is great. A keeper. Just made this with halloumi skewers for a yummy vegetarian dinner. Delish! Will definitely be making it again seeing as it was such a hit with the youngsters. Hello Chelsea, the avocado salad looks great!